After updating to AirBeam 2.0 i get the message 'Unknown device type cannot be displayed'? Unfortunately there is a small bug and this may happen if your device name contains special characters. Bug will be fixed asap, meanwhile a workaround is to remove special characters from device name. Device name can be changed in device settings app > General > About > Name. How can I watch my AirBeam cameras from anywhere in the Internet? AirBeam’s autodiscovery mechanism only works when all your devices are in the same local WiFi network. If you want to connect to your camera at home from anywhere in the Internet (or from a cellular network), you first need to configure a port forwarding in your home WiFi router. Otherwise the router’s integrated firewall will block all incoming connections from the outside world. Since AirBeam for iOS 1.4, the app can automatically configure port forwarding with your router. Prerequisite is that your router supports and has enabled Universal Plug and Play (UPNP) or Apple’s NAT-Port Mapping Protocol. In this case just switch on „Port Mapping“ in AirBeam’s general settings page. If successful, a small cloud icon on AirBeam’s camera view will indicate that the camera is reachable in the Internet and you will see the public addresses by touching the icon. Just use a browser or AirBeam’s „manual connect“ button to connect to these addresses from anywhere. As the public IP address of your WiFi router might change from time to time (depending on your Internet Service Provider), it is recommended to use a free dynamic DNS service like http://www.no-ip.com to be able to access your camera with a constant hostname. If your router does not support automatic port forwarding via UPNP or NAT-PMP, you can establish the required port mapping manually with your router’s configuration tool. A step by step example how to set it up can be found here. My camera does not appear automatically on the monitor device - what to do? Restart your WiFi router – we had quite some case where this solved the problem. Ensure devices have basic connectivity (e.g. by checking a web page in Safari). Try to connect the devices manually. To do so start the camera on one device and look up the IP address of the camera on AirBeam’s settings page. On the other device, hit the manual connect button in the lower right corner of the monitor tab. Enter the IP address of the camera you looked up before. If manually connect also doesn’t work, try to access AirBeam’s build in the web server by entering the URL displayed on the recordings tab into Safari on another device (e.g. from your Mac). If all this doesn’t help, try to check on another WiFi network. You can also contact us via our support page and please also let us know the exact WiFi router (brand, model) you are using. Can I also use a camera device connected via a cellular mobile network (instead of WiFi)? Unfortunately this is not possible today as cellular mobile data networks don’t allow incoming connections towards a camera device. Video playback isn't smooth when I have enabled Bluetooth on my device? iPhones, iPods and iPads use a single build in antenna for WiFi and Bluetooth communication. Activating Bluetooth can interfere with and degrade the performance of your WiFi connection. So you might want to disable Bluetooth when using AirBeam. Is there a way to turn off the screen completely on the camera device? Unfortunately the device can’t be locked completely while video capturing continues in the background. The available Apple APIs simply don’t permit this. However, since AirBeam for iOS 1.4, you can enable a „lock screen“ in AirBeam’s general settings. If enabled, the screen will turn dark after 30 seconds in camera mode and will come back as soon as you touch the screen. If you’ve set a password in addition, the app will show a simulate a lock screen similar to the official iOS lock screen. You will have to enter the password you’ve set to get back into the app. Where are AirBeam's recordings stored? 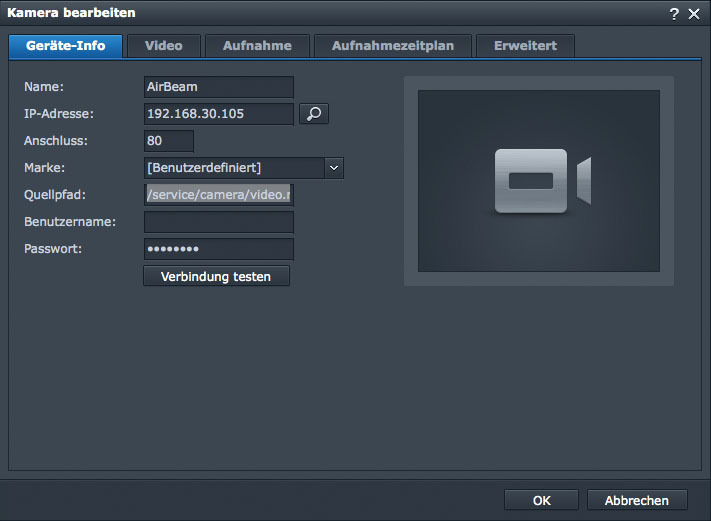 By default AirBeam stores all recordings locally on the camera device – even when they are started from a remote monitor. If you use the OSX version, all recordings are stored in folder called „AirBeam“ in your Movies folder. How can I integrate the AirBeam video stream with 3rd party surveillance applications? The app offers a standard Motion-JPEG video stream that can be integrate into many 3rd party surveillance solution like Synology Surveillance Station, Security Spy, etc. The web server delivering this stream listens on the standard web port (80 for iOS, 8124 for OSX) and responds to the URL-Path „/service/camera/video.mjpeg“. For older versions of AirBeam (1.x) the URL-Path is just „/video“. How ca i watch the AirBeam video stream with VLC ?